From the moment I opened page one, I was completely captivated by this story. It's unique and dark and at the same time has an epicness to it. The reality of what the Hole is will stun you as a reader. It was really hard for me to even wrap my mind around the atrocities there, let alone being an innocent and forced to live in those conditions. This is a world where anything can happen, and often does. The guards are untouchable and the other sinners have given up all hope. They have nothing to lose so it doesn't matter what they do or who they do it to. In this world, the tattoo on your neck defines who you are and that's all anyone sees when they look at you. It doesn't matter what the story is behind your tattoo. 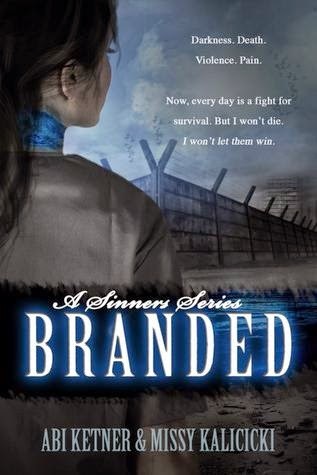 Once you've been branded, that's who you become. Not only to everyone else, but eventually in your own sight as well. This was a really fast-paced read and I couldn't put it down. The story telling is compelling but it's so much more than that. We have all these intricate mysteries that we're trying to figure out while at the same time being put in the middle of horrific nonstop action events. Your mind is so busy that you can't help but devour more and while you're reading more, your mind is working on that as well as trying to process everything you've just read. If the description piqued your interest, this book will not let you down. It's as fascinating and satisfying as it sounds.